Slice up the apples and make Easy Apple-Pecan Strudel in under an hour. 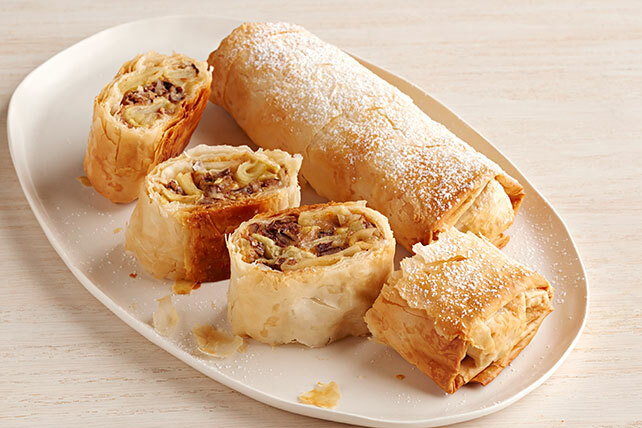 Phyllo dough makes preparing Easy Apple-Pecan Strudel a super simple process. Combine dry pudding mix, nuts, flour, lemon zest and cinnamon in large bowl. Add apples; toss until evenly coated. Unfold phyllo sheets; cover with plastic wrap, then a damp towel. Spray 1 phyllo sheet with cooking spray; top with 5 of the remaining phyllo sheets, spraying each sheet with additional cooking spray before using as directed. Spoon half the apple mixture down one short side of phyllo stack, leaving a 1-inch border. Fold over both long sides of phyllo, then roll up, starting at apple-topped short side. Place, seam side down, on parchment-covered baking sheet. Repeat with remaining phyllo sheets and apple mixture. Brush with butter. Cut diagonal slits in top of each. Bake 25 to 30 min. or until golden brown. Cool 5 min. Sprinkle with powdered sugar. Serve warm. Use remaining pudding mix to prepare pudding as directed on package, using 1 cup cold milk.